This auction is for the Soviet hydrofoil boat that Soviet Leader Leonid Brezhnev gave to President Richard Nixon in year 1972. The model name of this boat is "Volga 70". 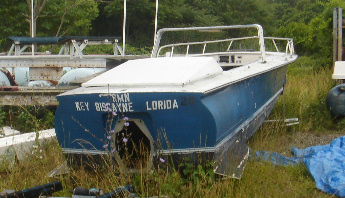 This boat was recently found partially buried in soil. Below are some actual pictures of this boat, in which you can see this boat was registered in Richard Nixon's Florida residence, in Biscayne Bay...This boat is currently stored in Brooklyn, New York. We would be glad to provide you with access to inspect the condition of this historical item in person and to verify it's authenticity. Now for the fill-in-the-blank portion of our test. Pencils ready? If Richard Nixon gives Leonid Brezhnev a Cadillac, then the Soviet leader should give the President a . Well, what? What socialist product evokes the Communist system the way a Cadillac does U.S. capitalism? A personal, hand-controlled Sputnik? A collective farm? It is a taxing problem, and the Russians have given up trying to solve it. Headed Nixon's way by freighter is a gift from Moscow as capitalist as they come: a hydrofoil boat. If it arrives in time for the Republican Convention, Nixon will be able to rooster-tail through the waters of Biscayne Bay between his Florida home and the convention hall in true and glorious helmsman's style. No bids on the boat so far. What we want to know is where is this baby being stored? Sheepshead Bay? Mill Basin? Marine Park? And was it found partly buried in soil in Brooklyn or was it moved here for storage? 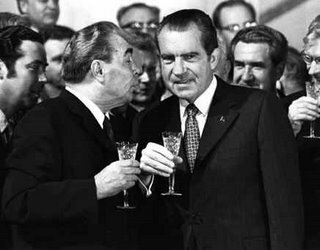 Personally, we are profoundly grateful for the opportunity to run a photo of Nixon and Brezhnev on GL, which is not something we can normally do and stay "on topic." wonder what the real story is... anybody know?